By 1921 more than a score of wind tunnels had been constructed the world over. But all those of substantial size were operating at normal atmospheric pressures. This meant that the experimental results obtained using scale models in the tunnels were open to question because a special parameter called the Reynolds number did not match those encountered in the actual flights of full-scale aircraft. In other words, the Reynolds number of 1/20-scale models being tested at operational flight velocities would be too low by a factor of 20. Reynolds' classic experiments had shown that airflow conditions could be radically different for model and full-scale aircraft. Since the Reynolds number is also proportional to air density, an obvious solution to the problem of scale effects would be to test 1/20-scale models at a pressure of 20 atmospheres. The Reynolds number would then be the same in the wind tunnel tests and actual full-scale flights. In June 1921 NACA's Executive Committee boldly decided to build a wind tunnel in which air pressures could be varied. Max Munk, formerly of Gottingen and now a NACA Technical Assistant, proposed building a wind tunnel in a big tank that could be pressurized to 20 atmospheres. The result was Langley Laboratory's Variable Density Tunnel (VDT). Wherever fluids flow in pipes, through an automobile radiator, or across an aircraft wing engineers use the Reynolds number to calculate flow characteristics. 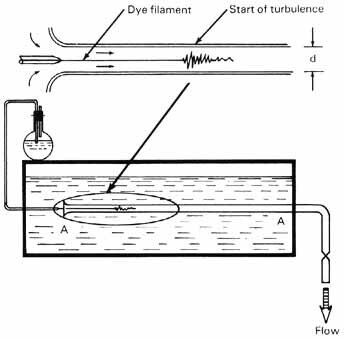 Osborne Reynolds had demonstrated in 1883 that the motion of a fluid may be either laminar or turbulent and that the change from one to the other may be abrupt In Reynolds' fundamental experiment, the flow of fluid through the A-A was made visible by injecting dye into the bell-mouthed tube as a thin filament of fluid. During laminar flow, the dye filament flowed unperturbed down the tube. As the flow velocity of the fluid was increased and turbulence set in the thin filament of dye broke up and spread through the tube. This transition always occurred when the ratio eVd / 11 was the same, where e = density [Greek letter rho?, Chris Gamble, html editor], v = velocity, d = pipe diameter, and µ = fluid viscosity. This ratio is now known as the Reynolds number. Cross section of the variable density tunnel showing the annular flow of returning air. Cross sections of the early series of NACA airfoils (from TR 460). ....Wind Tunnel No. 1. The maximum air velocity was only 50 mph, but it was the high pressure that was important. By March 1923 the VDT was operational. It quickly established itself as the primary source for aerodynamic data at high Reynolds numbers. Models of all manner of aircraft were tested, ranging from ponderous Zeppelins to military airplanes. Probably the main contribution of the VDT to aviation came in 1933 with the publication of NACA Technical Report 460, in which aerodynamic data for 78 related airfoil sections were presented. Like much NACA research, the information in this rather dry, highly technical report eventually found its way into the designs of spectacularly successful aircraft-the DC-3 transport (still operating in many areas), the B-17 Flying Fortress, and the famous twin-tailed P-38 that helped check the Japanese Zeros in World War II. Operation of the VDT was not without trials and tribulations. It was partially destroyed by fire in August 1927, but the pressure tank enclosing it was not seriously damaged, and it was rebuilt and again operational by December 1930. It was the VDT above all that established NACA as a technically competent research organization. It was a technological quantum jump that rejuvenated American aerodynamic research and, in time, led to some of the best aircraft in the world. 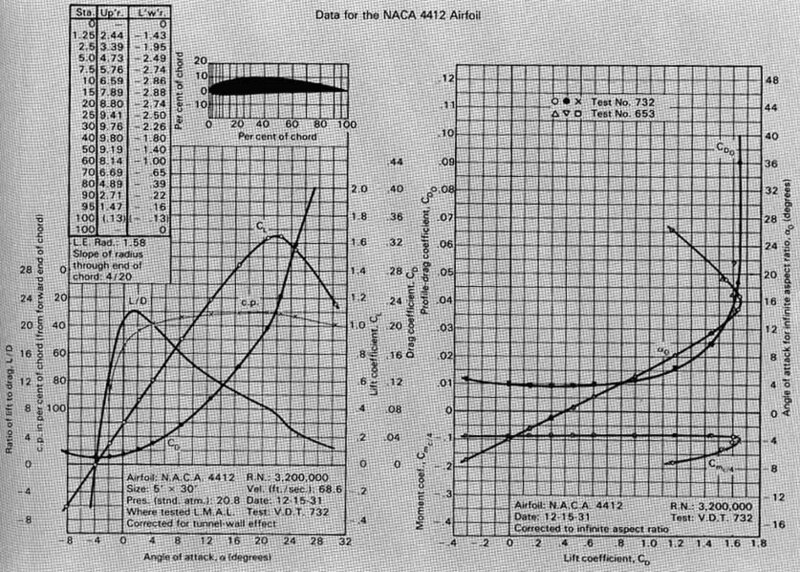 NACA's classic Technical Report 460, published in 1933, contained airfoil reference data in this format. 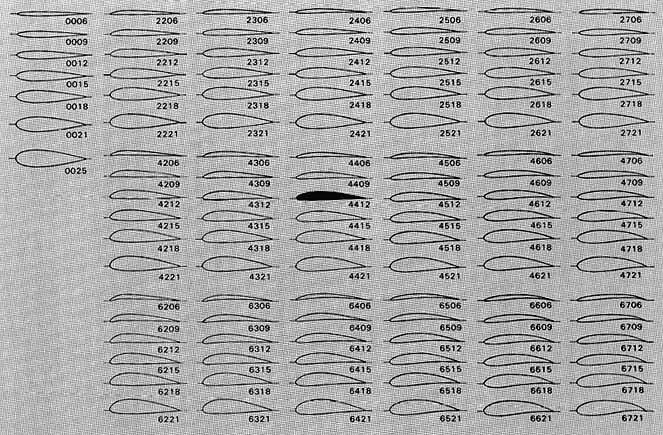 An aircraft designer could refer to lift and drag carves for each of 78 airfoils and choose the one best suited to his application. Because these data were measured at the Reynolds numbers actually encountered in flight, scale effects were minimized. No aircraft designer could afford to he without the systematic and comprehensive NACA TR 460.